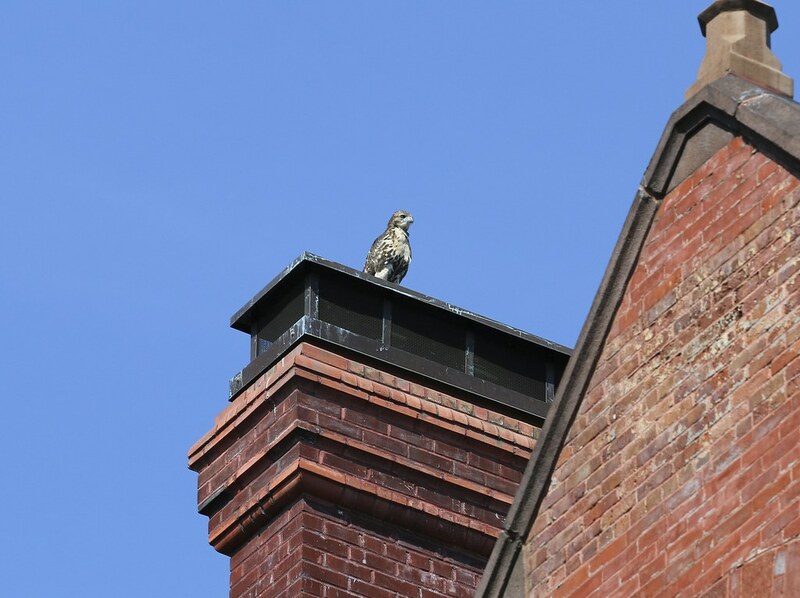 All the Tompkins Square hawk fledglings seem to be out of the nest. 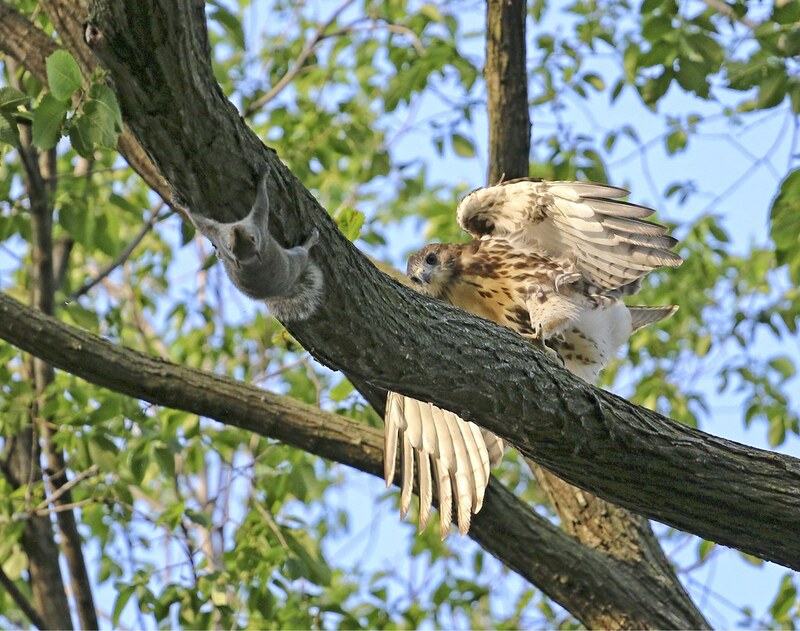 To date, I've only been able to confirm the location of two fledglings at a time, and I'm not sure if they are the same or different individuals each time I see them, so I can't really say if/when the last hawk kid left the nest. This last Saturday, all five family members were seen at the nest around dinner time, but on Sunday, it appeared the nest might be empty. While Christo had been feeding the kids in the nest for some time, he fed them lunch and dinner in different locations on Sunday. 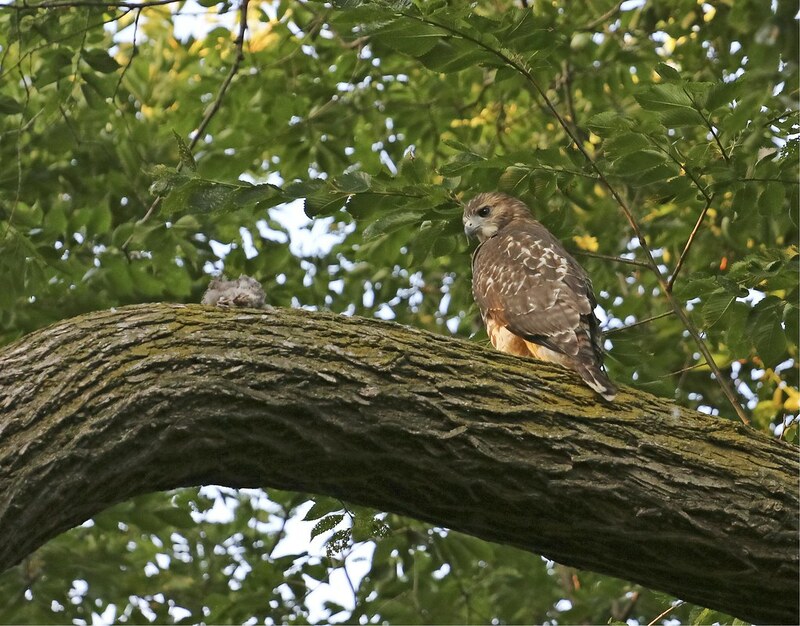 He called two fledglings to the large elm just across the path from the ginkgo tree (that houses the nest) to the north. The tree has a couple of large branches that work well for a dinner table and are low enough for people to get a good view. The meal was pigeon. The kid picked at it, then decided it would rather play around in the tree rather than eat lunch. One of the other kids went exploring across the street on the rooftops along Avenue B. Back in the park, Christo appeared at the Feeding Tree, looking very dashing on this Father's Day. 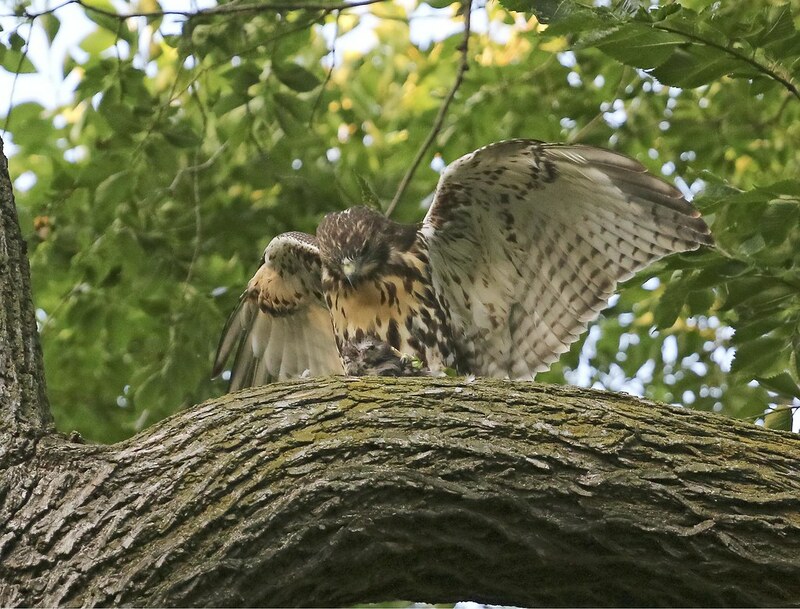 He flew off, then quickly returned with a mouse. 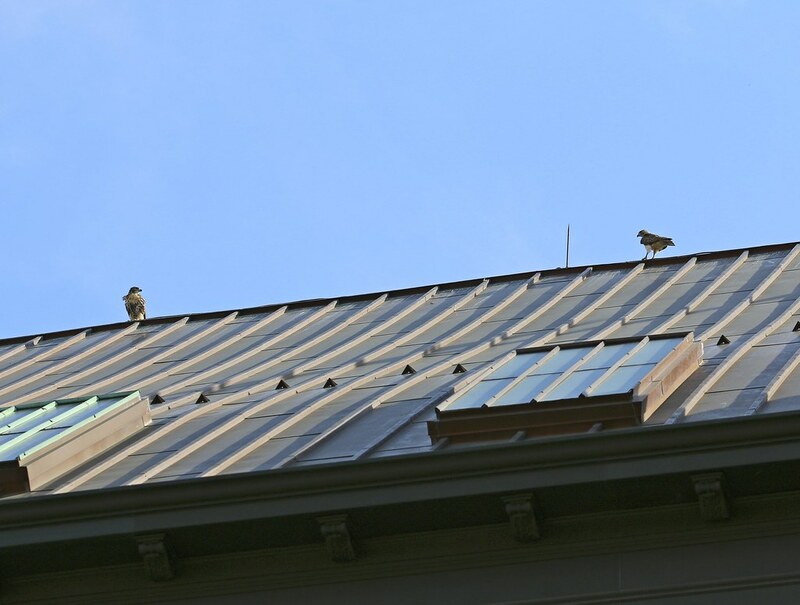 He took the mouse to the roof of St Brigid's where one of the fledglings (left) waited to be fed. 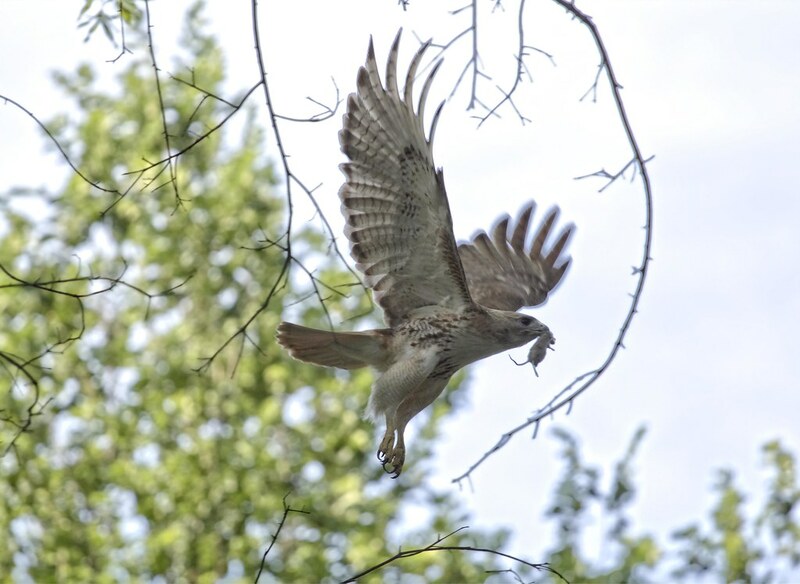 Without prepping the meal, Christo dropped it off for the fledgling to retrieve. It gobbled it down in just a couple of bites. 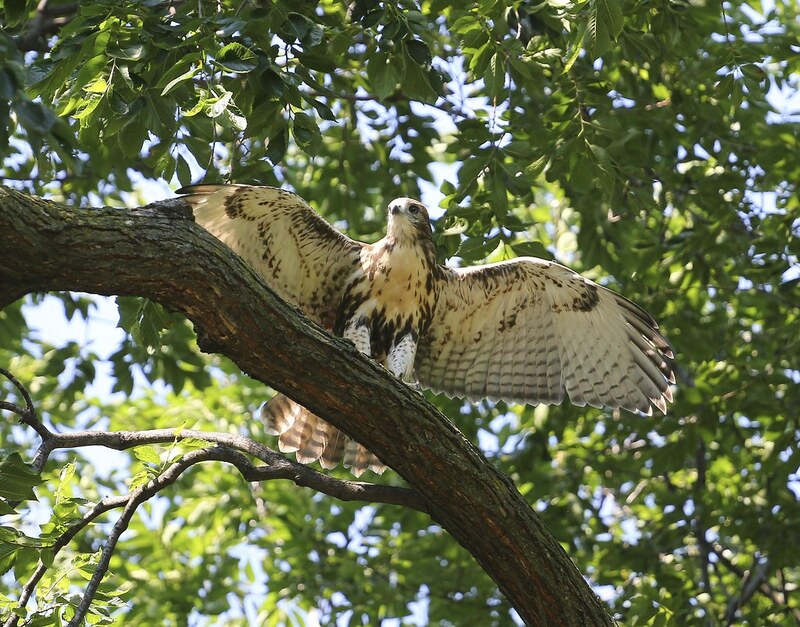 Meanwhile, in a tree near the handball courts, one of the siblings patiently waited for food. By this time, a couple of hours had passed since the first fledgling had passed up the pigeon. 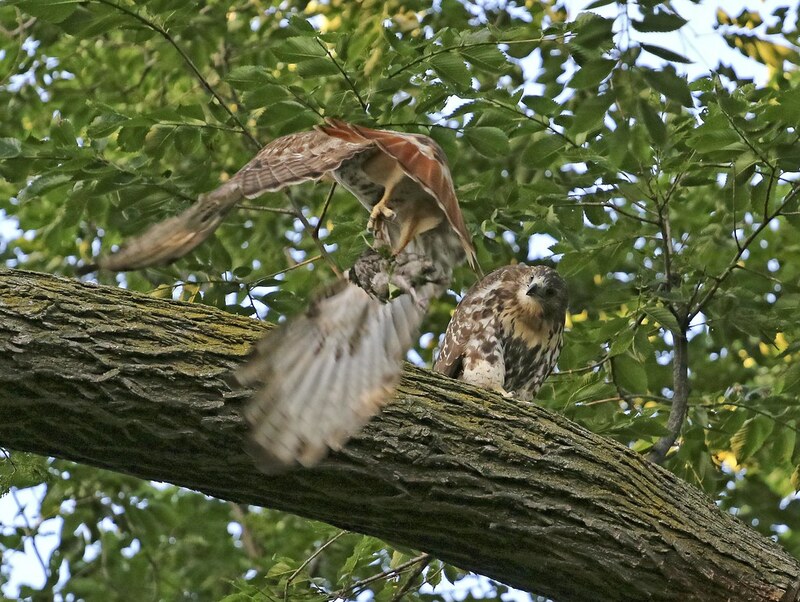 Christo returned to the uneaten meal, plucked it some more, then took it to the tree where the above fledgling was perched. Something happened in the transfer, and the pigeon ended up falling down to the path below. 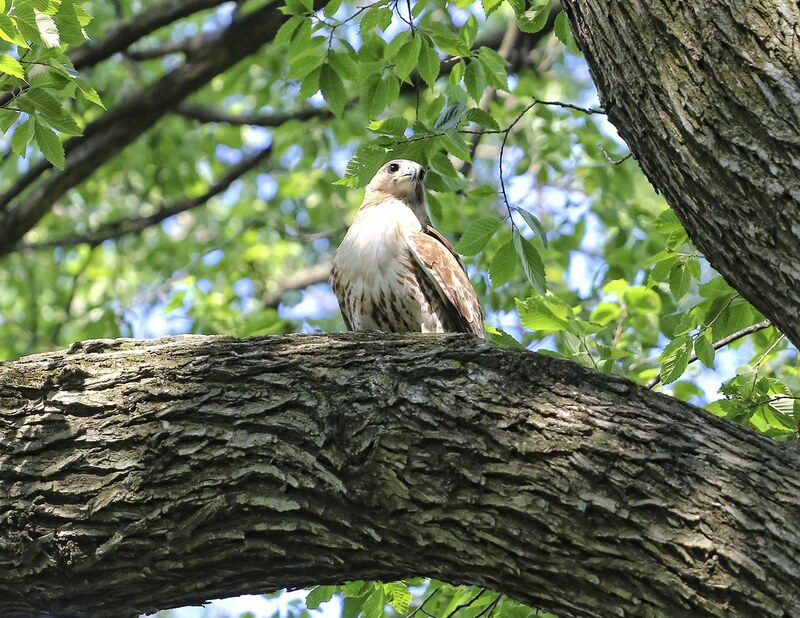 A crowd gathered and watched as the fledgling hawk looked down at the pigeon, and Christo watched the whole scene from the locust tree on the south side of the path. 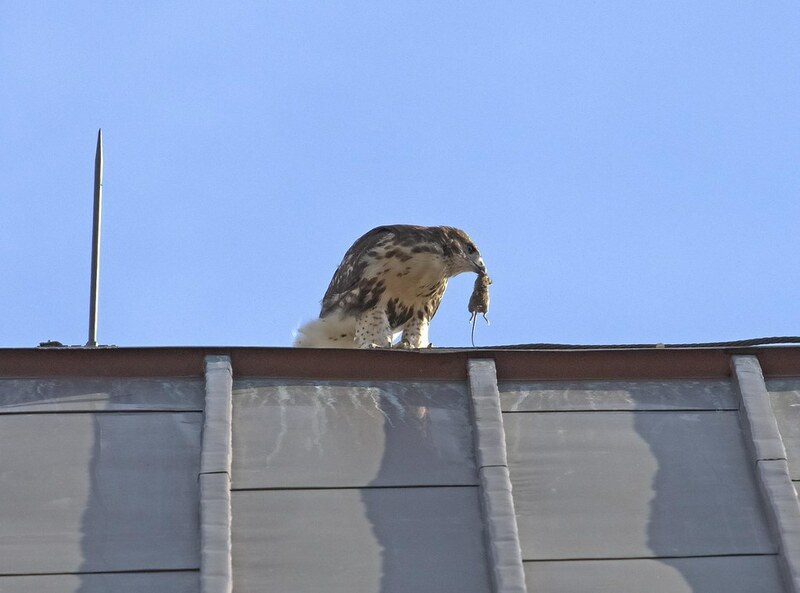 One person, who likely had good intentions, picked up the pigeon and dangled it below the fledgling. This, however, is not the right thing to do. 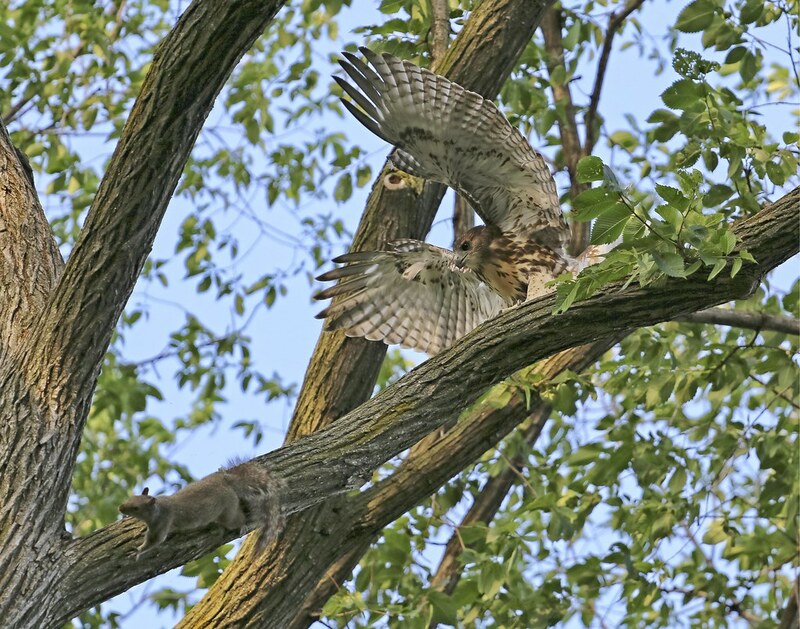 The hawks are wild animals - they are not tame - and they will not come when called, eat out of your hand, or land on your arm. 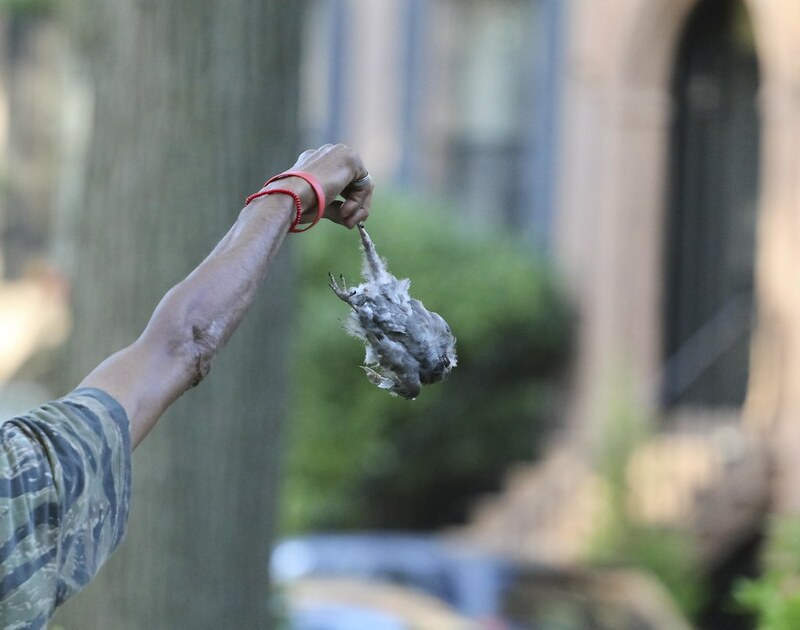 A dispute broke out in the crowd about this, as several people told the man to drop the pigeon. Eventually, he did, but it was in the middle of the path where it was likely to be trampled. 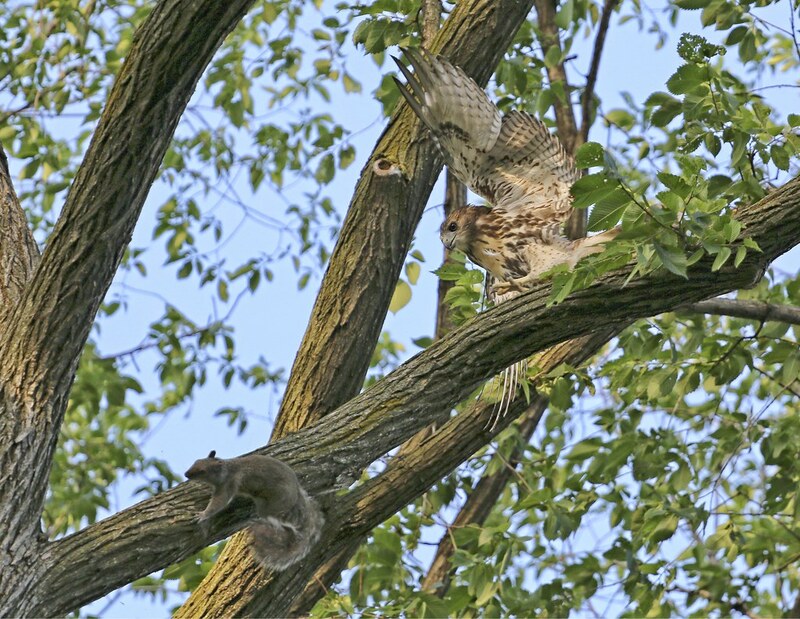 While the drama played out below, the fledgling in the tree decided to chase after a squirrel. As the dead pigeon was in a bad location, a good Samaritan picked it up and moved it to the other side of the fence, closer to where Christo perched. After a few minutes. Christo began swooping over the area. I really didn't think he'd go back for the pigeon after all that, but he sure looked interested. 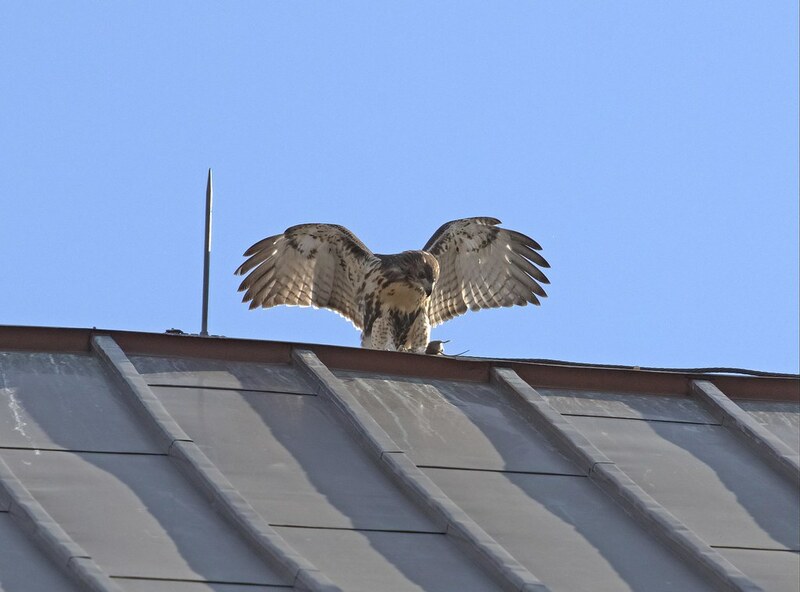 However, there were still so many people around, he may have been nervous and flew off towards Avenue A. After a few more minutes, the crowd had mostly dispersed and Christo returned. 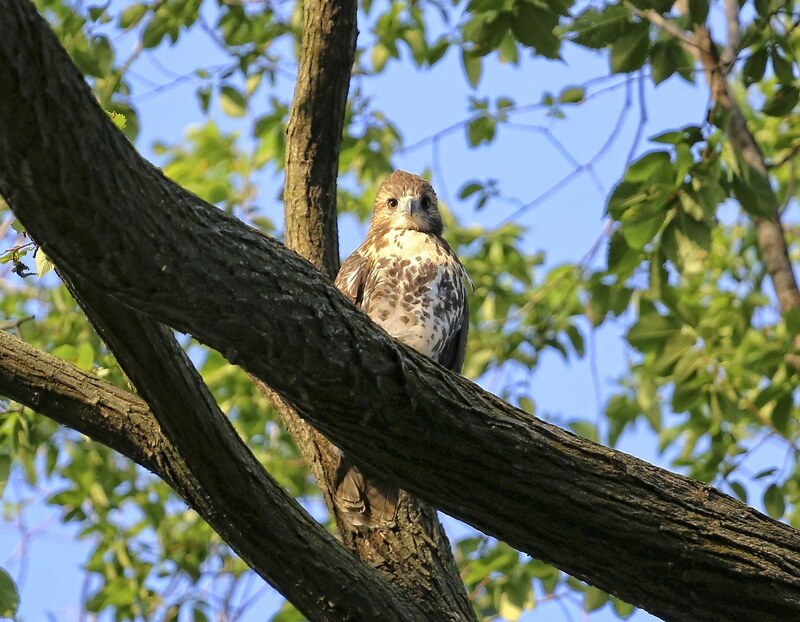 To my surprise, he retrieved the pigeon and took it to a fledgling who was waiting in the big elm to the west of the ginkgo. At this point, I really didn't know if this was the same fledgling who had been by the handball courts, or a different one. 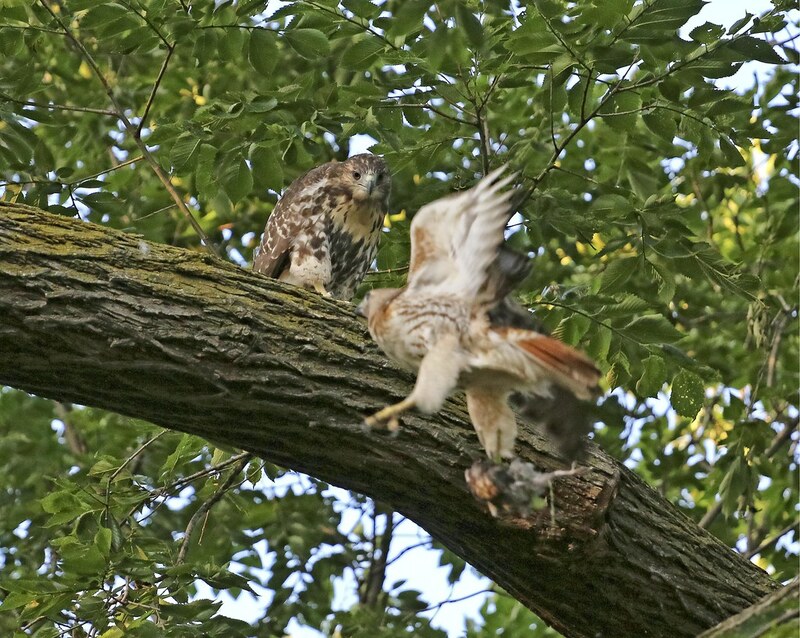 After dropping off dinner, Christo took off and the fledgling toyed with its food. It pecked at it, but slowly scooched away from it. After all Christo's hard work, the kid wouldn't eat! My theory is the young hawks are expecting dad to tear up their food for them. Swallowing a mouse is easy, but a big pigeon steak requires more preparation and they need to learn to do this themselves. Anyway, it was wonderful and educational to watch the whole feeding sequence. Christo is a great provider and he's taking good care of his kids. **Note about trees - Michael Natale of Tompkins Trees put together this great map of all the trees in the Tompkins Square Park. I've used it to identify the trees mentioned in this blog.